For whatever reason I had assumed that I had reviewed this cigar for some time now. 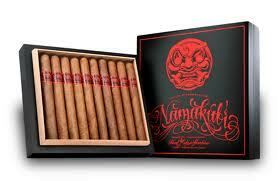 I went on reviewing other cigars and then, one day, while smoking another Namakubi, I decided to see what my review said. To my surprise there was no review. I mentioned this at the end of my Top 10 Cigars 2012 post and now I am rectifying that oversight. This one is the very short vitola, called the Roxxo, and it is easily my favorite in the line. It doesn’t look perfect, perhaps a little rustic. There’s some bumps and veins and the color of the wrapper is a lighter than medium brown color. It has a little bit of oils on the wrapper and looks well made (well made at the Camacho factories by the way). Although in many ways long gone, Samurai culture is believed to live on in spirit within certain groups. In ancient times when two Samurai clans would gather for competition there was a great deal at stake. Normally, the losing party would die as a result of wounds sustained in battle or be executed upon defeat. The Namakubi, or freshly severed head of the losing party would be prepared on a wooden tray then tagged in a regimented manner and presented to the leader of the winning clan as a gift. We, as modern day samurai, present to you our own Namakubi. I don’t get to say this much about cigars but this one has a refreshing flavor profile. Bright flavors but also very strong. Visceral spice, which could be too strong and unruly on its own, is retarded by what I can only describe as minty effervescence (I spelled “effervescence” correctly on my first try! Now if I can only learn how to spell “occassion” [sic]). With the larger vitolas I think the flavor profile skews too far towards the minty pole but with the smaller ones the balance is just right. During the second third the spice gets notched up a peg or two and vice a versa for mint, which is fine by me. There’s also some oak that comes on during this third. Basically, this is still a bright and refreshing cigar. Very enjoyable. The final third isn’t refreshing but it’s still enjoyable (to a lesser degree than the first two thirds however). The spice has fallen into this milieu of mint, bread and perhaps a little meat and earth as well. Unfortunately, more flavors doesn’t always mean that the flavor profile has improved; this is one of those times. Still good, I just preferred the refreshing profile from the first two thirds. Full bodied (just barely) with a good draw and burn; this cigar was a definite joy to smoke during the first two thirds and finished unspectacularly. In no way is that a condemnation of this cigar because even if the cigar had only had the flavor profile of the final third it would have been a very good cigar. Add in the first two thirds, which were excellent, and we have a great cigar.